Anyone who’s been around the Portland tech scene for long will know that Rick Turoczy is an amazing advocate, promoting local web technologies far and wide. Last night he was on KGW’s Hot Box news program, and mentioned Calagator along with several other projects. Click the link to see our five seconds of tv fame. 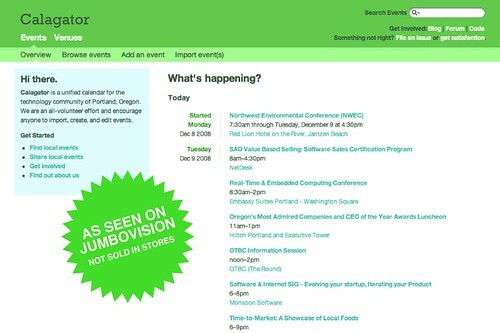 Rick also talked about Calagator in his Portland Web Innovators presentation on the State of Portland Tech in 2008. Watch the video to hear about how far we’ve come in the past year. 2008 has seen a huge surge in events, new projects, and other interesting tech activity, and the Calagator team is happy to be a part of this, both as an ongoing software project, and something that facilitates our community meeting up and geeking out.